There are plenty of services that let you set up a conference call from your PC. But what if you're out of the office? What if you don't have easy access to your laptop--or don't want to spend 10 minutes waiting for it to boot just so you can access your browser? Now there's an app alternative. 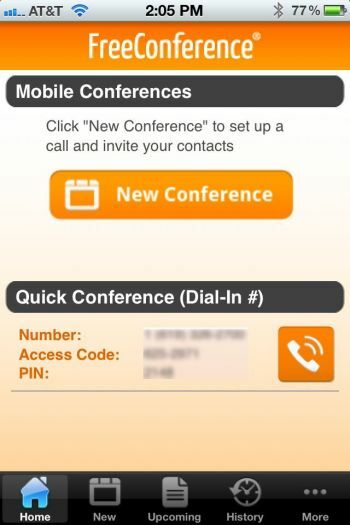 With FreeConference Mobile for Android and iOS, you can schedule and connect to conference calls right on your smartphone. It's pretty cool in principle--but has a few problems with execution. The app links to your FreeConference.com account. Don't have one? You can sign up for free in the app. In fact, the whole service is free, though you can pay for premium extras like a toll-free number and call recording. Amazingly, a free conference can accommodate up to 150 participants. I tested the app on both an Android phone and an iPhone, and found that the latter offered the nicer, easier-to-navigate interface--though the Android version is perfectly functional. Setting up a conference call requires just a few taps. Choose a date, time, and duration, enter a subject, and then select the participants from your phone's address book. This last step proved problematic on my iPhone, as for some reason the app listed all my contacts twice. Equally annoying, you can't manually input a participant; each person must be in your address book. On the plus side, you can create groups, which makes participant selection infinitely easier for subsequent conferences. When the selection process is done, you can have invitations delivered via e-mail and/or text message. Based on my tests, FreeConference Mobile suffers from two major shortcomings. First, it doesn't seem to sync properly (or at all). Conferences created on say, the Web or an Android phone don't appear on your iPhone, and vice-versa. Second, although there's a quick-dial button that promises to connect you to your conference, it doesn't work. On both my phones, tapping the button resulted in this: "Your call cannot be completed as dialed." I'm guessing that's because the app tacks on the access code and PIN to the number it's dialing, but obviously that doesn't work for outbound calls. Consequently, I had to write down the numbers and then dial them all manually. Another glitch: The iPhone app promises to save conference details to the calendar, but in my tests this flat-out didn't happen. So, why am I writing about an app that's a train wreck right out of the gate? Because FreeConference.com itself is such a great service, and there's such huge potential for the apps once the bugs get fixed. Even if you don't want to mess with FreeConference Mobile in its current state, it's something to bookmark for later, as it could prove invaluable to the frequent conference caller.